Pairing tech savvy schoolkids with older people struggling with new technology has proved a perfect match in the Victorian town of Traralgon. 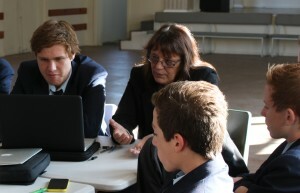 The idea of a service to help older peoplein the community with their digital devices staffed by local high school students seemed logical to Joh Lyons, project worker for the Digital Shed, a project of Traralgon Neighbourhood Learning House. As a former secondary school teacher, Joh knew that many local high schools offered Community Service one day a week. She also knew that what seemed simple to high school kids – using email, setting up apps, shopping online – could be more challenging for older members of the community. Established in 2013, the Digital Shed offers a drop in service where high school students help community members with easy-to-understand technical information and advice. Will Snell was 13 when he started working at the Traralgon Digital Shed two years ago. He took on the job as part of a Community Service subject at his school, Lavalla Catholic College. In that time he reckons he’s taught over 100 customers how to use their digital devices more confidently. With his flair for ICT, Will was a good candidate for the tutoring job but once he started he found that people skills were just as important. Lyn now uses her tablet daily for keeping up with her grandkids, playing games with friends and ‘sticky nosing all over the world’ on Google. get help in setting up and using her new devices.